The name itself is a clue that this is parody. Koshary is the tastiest of Egypt’s indigenous fast foods, an unlikely mix of lentils, chickpeas, rice, and pasta topped with a spiced tomato sauce and fried onions, and accompanied by two kinds of hot sauces. As odd a name for a newspaper as, say, The Onion. El Koshary parodies many of the excesses of the uprisings with such headlines as “El Baradei Reveals He is a Trained Jedi Master“, parodying the claims made by (and for) Muhammed El Baradei as a contender for high Egyptian public office; How to Become a Political Activist, skewering the pretensions of those who came late to the revolution but are among its most vocal supporters; and Egypt’s Elite Declare Independence From Egypt. The faux newspaper also offers many satires of religious conservatives with stories like Salafis demand Hindus and Buddhists who were Muslims in a previous life to reconvert and Muslim Brotherhood launches online dating site. And in addition to the story that snagged my friend, there are many stories laughing at the foibles of everyday life in Egypt, including Men who sexually harass women admit to having “small balls”, and Egypt’s gay community “homophobic”. In case you haven’t noticed, El Koshary Today is not a “real” news site. Our philosophy here is to use sarcasm and imagination to raise awareness of some of the serious (and not so serious) issues plaguing our nation. It is not intended to relay any factual information or credible circumstances, though where possible readers will find news links to the actual issues being satirized herein. My friend should not be embarrassed, though (and she doesn’t seem to be–she responded “lol!!!!!!!!!”). As Colleen Cotter pointed out recently, the power of parody news depends on how mimetic its structure and style are with mainstream news (2011). Former Onion editor-in-chief Rob Seigel has said that the journalistic form is “the vessel.…It has to look like real journalism to create the comedic tension between what is being said and how it is presented” (Wenner, 2002). Dominick Boyer and Alexei Yurchak (2010) go further, arguing that part of the power of discourses that “imitate and inhabit the formal features of authoritative discourses” is their very ambiguity, so that ” it [is] often difficult to tell whether it [is] a form of sincere support, subtle ridicule, or a peculiar mixture of the two.” The humor of parody news derives from this tension between genuine and spurious . News discourses provide contemporary societies with some of the functions played by myths: they offer authoritative accounts in a formalized language that symbolically dramatize breaches of normative social order (Arno 2009). The cultural order encoded in these myths in turn supports the broader social order. News satires expose the mythological function of news by making explicit the social values expressed implicitly in news stories. This has a significant political dimension. “By employing irony these news satires provide a social critique of people and institutional power” (McCue 2009). These kinds of politically significant parodies of authoritative discourses are particularly likely to emerge when changing ideological conditions and social, economic and political tensions produce situations of “hypernormalization” (Boyer and Yurchak 2010) in which public discourse becomes increasingly polarized around narrow definitions of acceptable social, economic and political action. Under these conditions, print and online news parody can surmount the rhetorical chill that falls over public culture, and serve as a site for developing new meta-discourses (Achter 2008). But one could easily make the argument that such “hypernormalization” has existed for twenty years or more in Egypt. Part of the reason no one saw the revolution coming is that Egyptian public discourse had settled into a kind of predictable complacency, even though private discourse remained quite critical, and irony abounded. Public parodic discourses were contained by Egypt’s broad but sporadically enforced censorship rules, and by a longstanding speech tradition of according increasing respect to people in increasingly hierarchical positions. So why Egypt? And why now? The emergence of news parody, both in El Koshary and Bassem Youssef‘s show is part of Egypt’s experimental moment. They represent a shift of political parody and ironic humor from the private realm of interpersonal intaractivity to the public sphere. They offer a continuation of the anti-structural elements that began in Tahrir Square and offer a carnivalesque experience that exposes and inverts traditional hierarchies. In general, if sustained, this would appear to be a good thing. Hariman argues that news parody is an important resources for creating and sustaining democratic public culture. “[B]y exposing the limits of public speech, transforming discursive demands into virtual images, setting those images before a carnivalesque audience, and celebrating social leveling while decentering all discourses within the ‘immense novel’ of the public address system,” parody creates a kind of laughter “which is the shock of delighted dislocation when mediation is revealed” (Hariman 2008). And Reilly (2011) suggests that as parody news becomes institutionalized it creates the possibility of emerging as part of a Fifth Estate, a watchdog on the news media, who are supposed to be the watchdog on government and corporate intrusions into people’s liberty, but too often become their voices. In a sense, social media has already emerged to a significant extent as a space for critical metacommentary on the media. But given the traditional structures of Egypt’s media as voices of the regime, the emergence of such a fifth estate could become an important factor in the new Egyptian polity. Inskeep, Steve (2012). “And Now For The Lighter Side Of Egypt’s Revolution”. National Public Radio. Amer, Pakinam (2009). 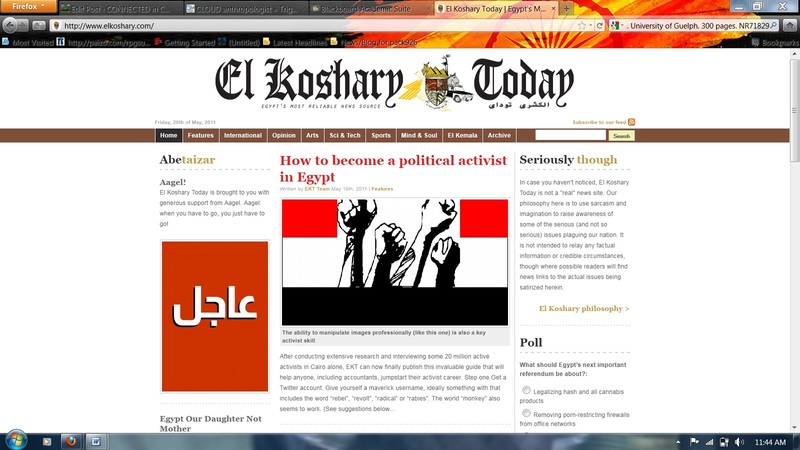 “El Koshary Today: Egypt’s online “fake news” paper”. Egypt Independent. “El Koshary Today Team “. Midan Masr. Achter, Paul. 2008. Comedy in Unfunny Times: News Parody and Carnival After 9/11. Critical Studies in Media Communication. 25(3):274-303. < http://www.informaworld.com/10.1080/15295030802192038 >. (accessed 20 May 2011). Boyer, Dominick. and Yurchak, Alexei. 2010. American Stiob: Or, What Late-Socialist Aesthetics of Parody Reveal about Contemporary Political Culture in the West. Cultural Anthropology 25: 179–221. Colleen Cotter. 2011. Diversity awareness and the role of language in cultural representations in news stories. Journal of Pragmatics 43(7): 1890-1899. Hariman, Robert. 2008. Political Parody and Public Culture. Quarterly Journal of Speech. 94(3):247-272. McCue, Daniel Brandon. 2009. When news breaks, “The Daily Show” fixes it: Exposing social values through satire. Unpublished M.A. Thesis. University of Nevada, Las Vegas. 95 pages; AAT 1456354. ← Who Are the Baltagiyya Anyway and Where Do They Come From?